To Be Or Not To Be. Brooksfilms 1983. Mel Brooks. Nazis. Shakespeare. Sounds like a lot of fun. My concern creeps in with the facts that this is a remake of a 40s film and has been described as less satirical than his best. When I think of Mel Brooks without satire, I think of Dracula: Dead and Loving It, which (as I said on Twitter) relied too much on physical comedy. Useless fact time: as you can find out from any other reference on this film, it’s the only time Mel Brooks acted in the same movie with his wife Anne Bancroft. Much like that Wall Street is notable for featuring Martin Sheen and Charlie Sheen as father and son (and Michael Douglas as the inspiration to all the authors of the economic recession), it’s an interesting fact that doesn’t mean much but takes up space. In 1940s Poland, Frederick and Anna Bronski run a successful theater. 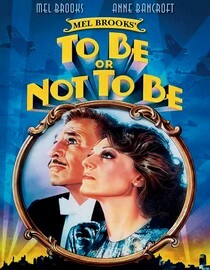 Polish air service Lieutenant Andrei Sobinski is taken with Anna and pursues an affair with her, in the form of chatting in her dressing room while Frederick performs his favorite Shakespeare soliloquy. Then the Nazis invade and everything changes. Sobinski fights the Germans in the R.A.F. until being assigned on a mission to stop Professor Stiletski from delivering a list of Polish Underground members to the Gestapo occupying Warsaw. Anna houses Sobinski and soon the two of them convince Frederick to pose as the Gestapo colonel to get the list from him. That charade leads to another and another, and a dizzying amount of subterfuge, ultimately involving Hitler himself for some reason. The sense of humor in this film is actually very much what I’m used to with Mel Brooks. Wordplay, frenzied scenes, and strong comedic/dramatic irony are all fully present. As far as satire, there’s plenty of commentary on comedy, show business, and it gets a lot of mileage out of being the first film to openly discuss the Nazis’ treatment of homosexuals. Brooks is Brooks. He’s a character actor with one character. It works, though. Anne Bancroft plays a Brooks leading lady well. The most notable performances to me come from the Charles Durning, the Gestapo Colonel, and Christopher Lloyd’s minor role portraying his well-starched Captain Schultz who “wouldn’t know anything about” anything that wasn’t included in his orders. This story is structured rather episodically. The end of the first masquerade felt like a good end of a story, but then they have to do it again and again. Frederick impersonates the Colonel for the Professor, then the Professor for the Colonel, then the Professor for the Colonel again, then Hitler for multiple German detachments. It’s simple enough to have been a play, yet complex enough to be a television miniseries. This is yet another thoroughly enjoyable Mel Brooks film, one which doesn’t get the amount of play it deserves. I liked it better than Blazing Saddles. I wonder if Brooks will ever run out of ways to make fun of the Nazis. Watch this movie: because there’s no such thing as too much Nazi mocking. Don’t watch this movie: if you can’t laugh at your villains.